The SOAS Syria Society is hosting a discussion with Waad Al-Khateab and Dr Hamza Al-Khateab this coming Thursday evening. Waad al-Khateab is a multi-award winning film maker who is best-known for her series of ‘Inside Aleppo’ films for Channel 4 News. Dr Hamza al-Khateab is a Syrian doctor who moved to Eastern Aleppo in 2011. He was the director of the biggest hospital in then-besieged Eastern Aleppo before its fall at the end of 2016. They were in one of the last convoys to leave Eastern Aleppo in December 2016. Waad and Hamza will be discussing their experience of siege, and comparing it to the current situation in eastern Ghouta where once again we see child deaths due to an enforced starvation siege by the Assad regime. Thursday 2nd November, 7.30 to 9 pm. Brunei Gallery Lecture Theatre (BGLT), SOAS University of London, 10 Thornhaugh Street, London WC1H 0XG. 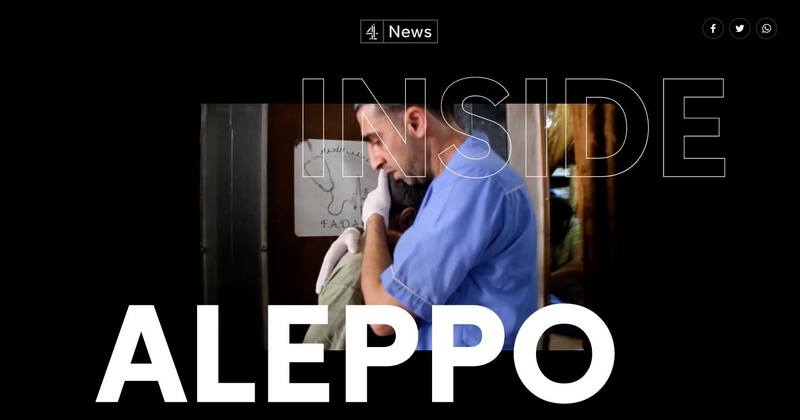 Watch Waad’s films on Channel 4’s Inside Aleppo website.